Dual Collaborative Gameplay – Players can choose to embody either Ray or Thomas, each with a distinctive gameplay style (close or long range), specific abilities (lasso, dynamite…), and weapons (dual guns, long-range carbine…). They collaborate with their other brother taking advantage of each of their strengths and joining fire in the fiercest fights imaginable. Deadly Gun slinging – Call of Juarez: Bound in Blood offers a visceral shooting experience, relying on gun skills and upgradeable guns. Whether close or long range, they harness a variety of weapons from heavy caliber canons to machine guns and various pistols for face-to-face duels. Every accurate shot increases their concentration, which allows them to unleash deadly shooting modes when outnumbered, and even deadlier ones when the brothers work together. Innovative Western-themed Multiplayer - Gunslingers, Bandits, and Marshalls struggle online for the bounty. Multiple characters are unlocked for team-based objectives modes or the straight forward team death match. 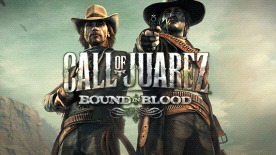 Call of Juarez: Bound in Blood introduces a Bounty system, which sees the players increase the bounty on their head with more kills and try to get rid of the deadliest among them to increase their bank-rolls! Objectives-driven, team based missions let them relive the most famous scenes of the Wild West (bank attack, train attack...).